"Silly Sentences" is a fun way to encourage beginning readers to enjoy reading. Young established readers will also find this game amusing. This game turns sentences around in such a way that children find particularly entertaining (especially those kids experimenting with their own budding sense of humor). By mismatching the beginning of each sentence with the end of another sentence, an otherwise ordinary story becomes very funny. 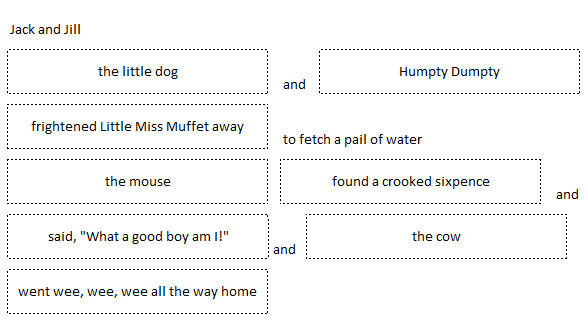 To play this game, you will need two containers to put the sentence pieces in, as well as the free printable sentences pages. "Part 1" is the first half of the sentence; "Part 2" is the second half. The "Background sheet" is optional - if you want to glue the two sentence pieces together to read them later, the background sheet makes it easy for young children to glue them. You will need to print three background sheets if you plan to use all of the sentences. One of the great advantages of this game is that you can play with any number of people. Whether you need an activity to occupy one child, or a game for a class party, this is enjoyable for any size group. Here is one example from our "Mixed-Up Halloween Party". Part 1 reads: "The pale vampire is". Part 2 may read: "sitting on my head." Together, the sentence says, "The pale vampire is sitting on my head." Kids really get a kick out of some of the ridiculous images this game conjures up.